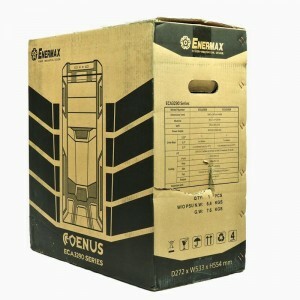 Enermax introduces an inexpensive case, the COENUS. Where did they get that name? According to Wikipedia, “Coenus (in Greek Koῖνος; died 326 BC), a son of Polemocrates and son-in-law of Parmenion, was one of the ablest and most faithful generals of Alexander the Great in his eastern expedition.” With a warrior’s helmet in the logo, they were clearly referring to that kind of excellence. Is this case “one of the ablest?” Let us see. 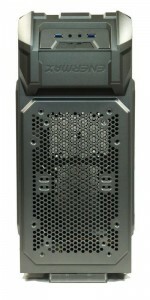 The case we will be exploring is the ECA3290A-G, a gunmetal gray case with a red LED fan in front. You can find it for $69.99 online, sometimes with free shipping. 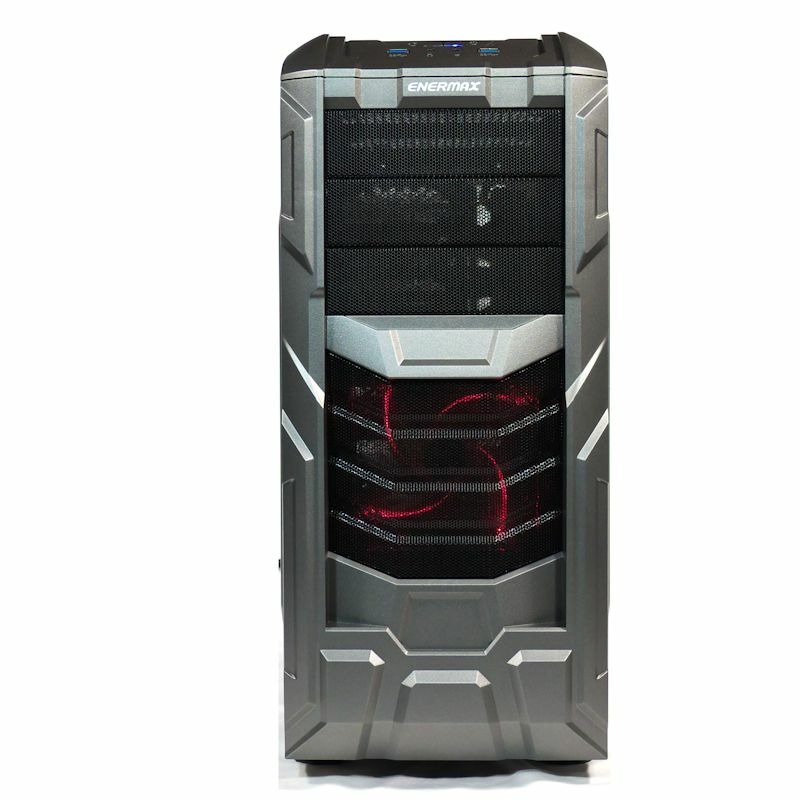 Enermax also says it offers a black ECA3290B-B that apparently has a blue LED fan in front, but I can’t find it for sale at the moment. According to the box, the B version sports two fewer 3.5/2.5 internal drive positions. Notice that they are advertising 30 mm clearance behind the motherboard tray as a feature. I have seen a few other cases so advertised, but not many. 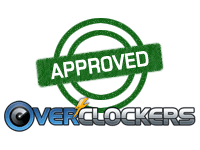 You can shop far more efficiently if the manufacturer tells you what the clearance is. Thank you, Enermax. That UCTA18A is a 180 mm fan. You can learn more about this case by downloading the datasheet. 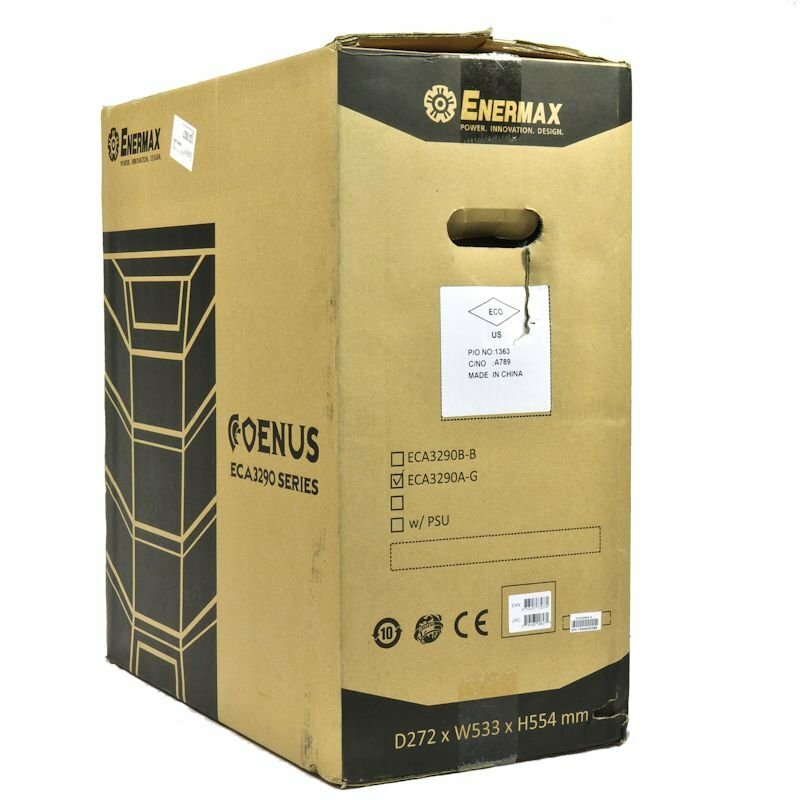 Enermax helps you even more by providing the user’s manual online, where you can study line drawings to help you decide if this case is for you. The frame part of the case is 210 mm (8.27″) wide, but the expanded sides make it 9.2″ wide, as noted above. Unlike some other cases, this extra room is apportioned to both sides. 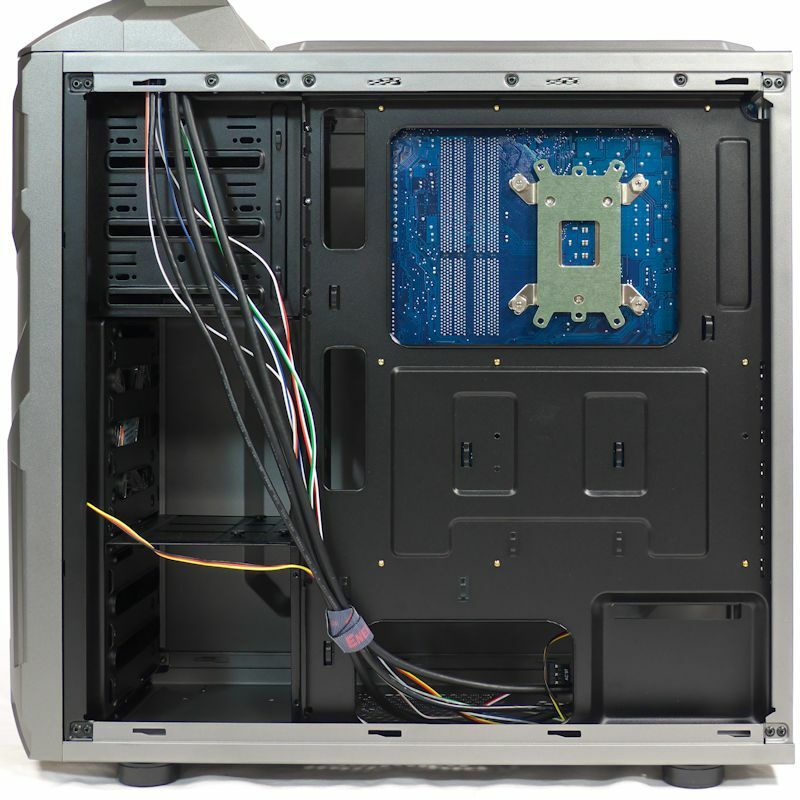 Not only is there plenty of room for cables in the back, but you can put a taller heatsink in the main chamber than you would expect. 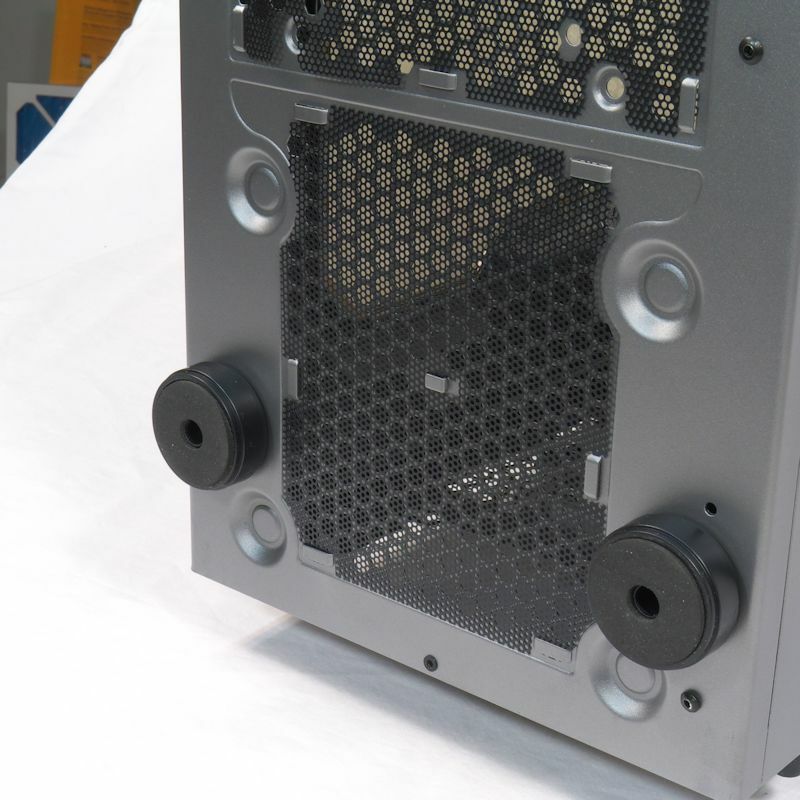 A 120 mm exhaust fan tells you the case will fit a full-tower heatsink. 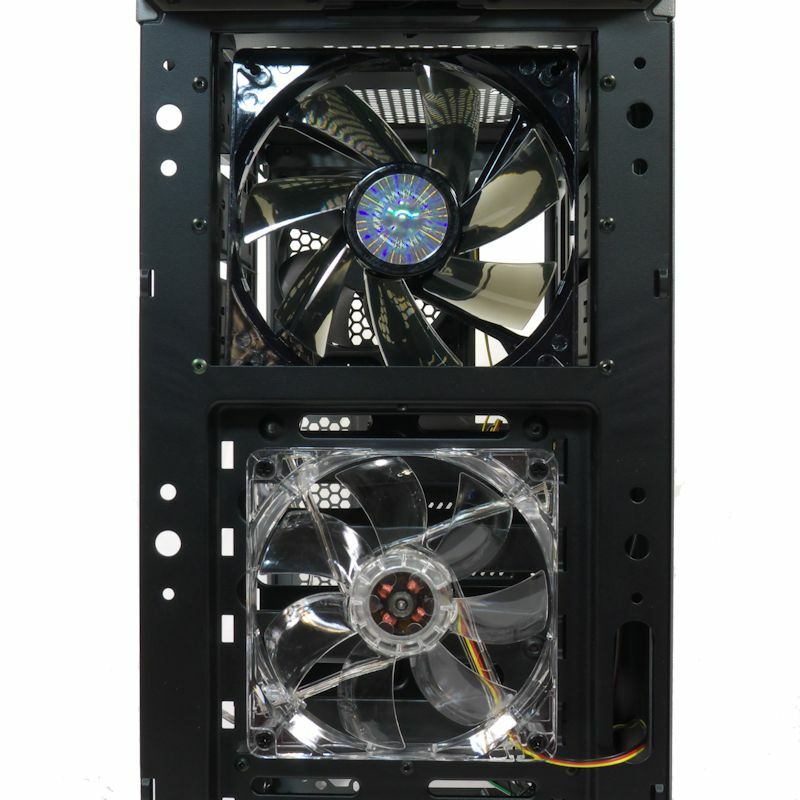 Usually you look for a 140 mm fan in the back to indicate you will have room for an extra-tall heatsink. But the COENUS with its expanded side has room for an extra-tall heatsink like the Archon. 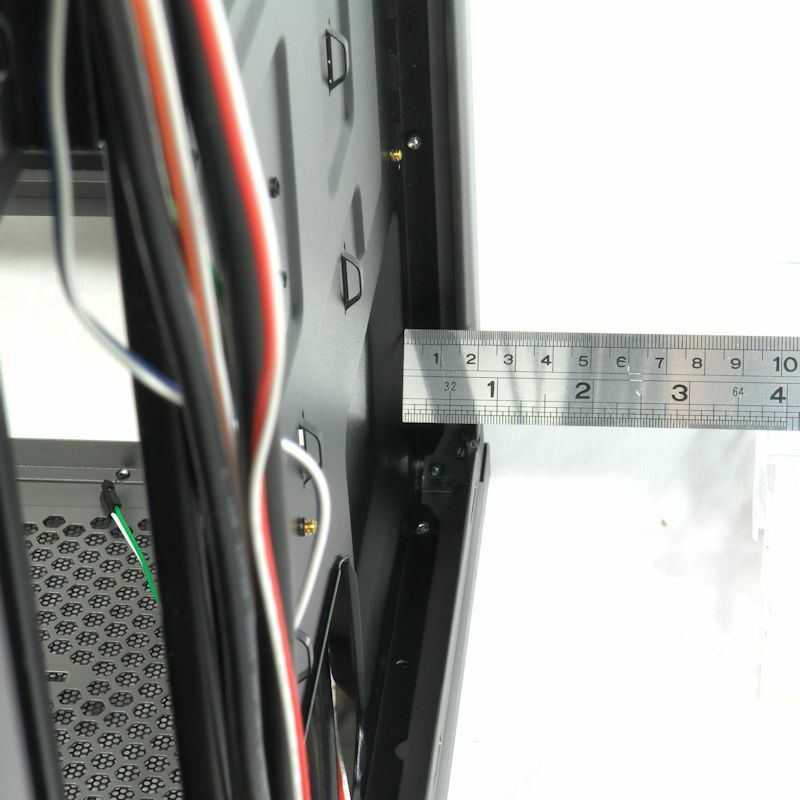 The case stands 19-5/16″ tall, by my measurement, a trifle taller than spec. 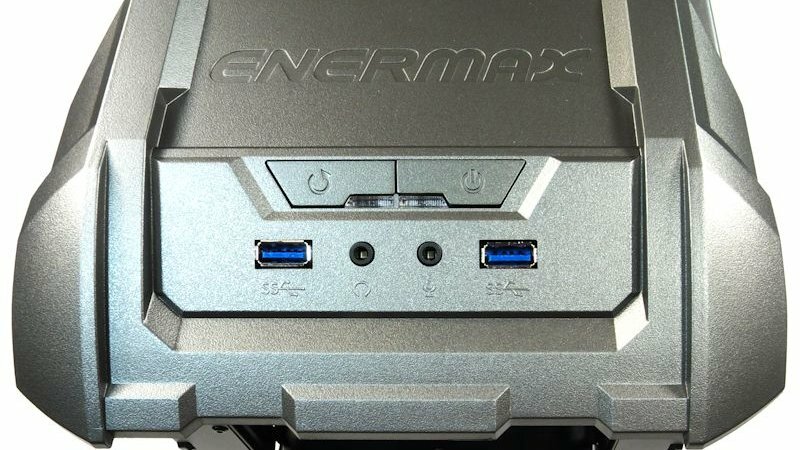 It may be 487 mm (19.17″) deep by Enermax’s measurement, but I think they forgot the handles at rear of the case. With those handles, I measured at least 520 mm deep (20.5″). That is probably an underestimate, as those handles jut well more than an inch behind the case. By the way, those rear handles perform as bumpers, so you can’t push this case so close to a wall that you will lose ventilation out the back. 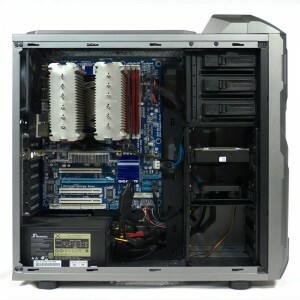 Not included in the official features or specifications lists are the lengths of video card you can put in the case. Depending on where you position the side wall of the upper HD cage, you can put a 290 mm, a 320 mm or a 415 mm graphics card in the COENUS. Finally, they include a cute little computer speaker. The case came in a box with black ink that conveyed the main specs and tells the shipper how big the shipping box is. Too bad about the damage to both ends. It looks like it took a bit of a beating. But on first glance the case came out OK. It was further protected from scratches by the typical plastic bag, and protective sheets on the inside and outside of the plastic side window. The front view of the Enermax COENUS shows the expanded right side panel. Due to the wide angle of the camera lens, the expanded sections of both panels could not be shown. Both are there, though. Aside from the controls at the top, an important aspect of this case is that the 5.25″ slot covers can act as dust filters. 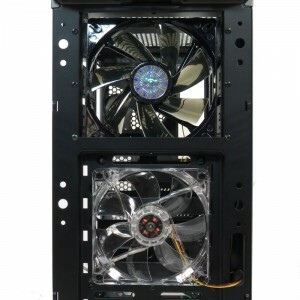 In the middle of the front panel we see a filtered area about one fan tall. This tells us that if we put two fans there they will be sucking hard on that front filter. We will need high static pressure fans if we opt for two. The next picture shows the left side of the case. As promised, the window is nicely pushed out. We can see from looking at the roof-line that the top is also pushed out. Finally, you can see one of the rear handles. They really do make pulling off the side panels so easy you don’t even think about it. 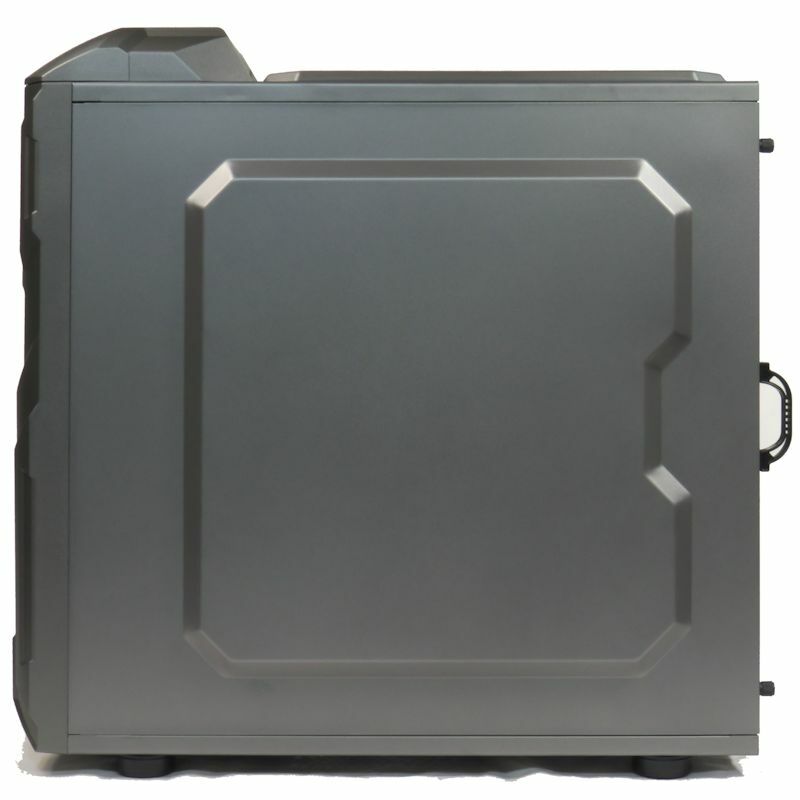 At the rear of the case we see space for the motherboard I/O panel, a 120 mm exhaust fan, two grommeted openings for waterheads, two handles attached to the side panels, seven expansion slots, and space for a bottom-mounted power supply. The right side view shows us the expanded right panel. The expanded roof-line and the rear handle we have seen before. The feet are fairly substantial. The top view of the COENUS shows us an ordinary grill in a section of raised steel. The screw holes mark patterns for 240 mm and 280 mm rads. Of course, you can put two 120 mm or two 140 mm fans there. If you are an airhead and have or can buy 140 mm fans, I recommend those for quieter airflow than you can get with 120 mm fans. You can also see the 154 mm screw hole pattern for 180mm fans. Those four holes are elongated to accommodate differing screw positions. 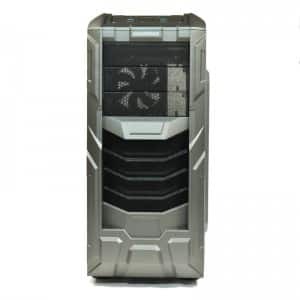 You will not be forced to use Enermax fans. The bottom view shows us that there is plenty of grill space not only for your PSU air intake, but also for a bottom fan, if you choose to use one. A closeup of the “removable dust filters” on the bottom shows that this one will be a pain to remove. I can tell you that neither is easy to put back when the case is on its feet. Worse – these are not actually filters but really, really restrictive grills. Better to have just left them off. 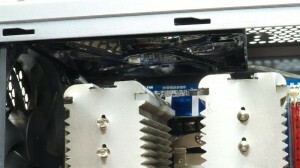 The I/O and controls for the case are located on the “head” that sits at the front of the COENUS. Well, we have been all over this case and we found no dings. Despite the damage the packaging took in shipping, the case came through fine. OK. Let’s open up the case. First off, let’s look at the inside of the left panel. First, we can see the rear handle and bumper. It looks small, but it is big enough to do its job. Next, we see the extended window panel with its protective plastic layer. 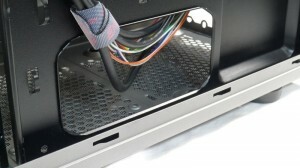 The top and bottom of the side panel have thin dogs to pull the panel tight against the case when it is pushed forward. That part is rather clumsy, but using that method helped keep the cost down. The front side, however, has an open-sided hinge. That would have been a nice touch except that the dogs and the lack of a bottom sill keep the open hinge from helping much. So you basically put the panel up against the case, and slide it forward to engage the dogs. True, it’s an easy slide, but it is old fashioned and a bit of a bother. One nice detail is the choice Enermax made on thumbscrews. 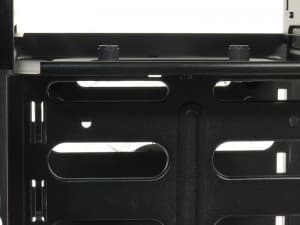 Instead of traditional single piece thumbscrews, the case designers chose plastic cylinders with the screws poking through. These are easier to work with than normal thumbscrews. We open the COENUS and this is what we see. First of all, the case may be gray on the outside but it is black on the inside. There are no grommets in the motherboard tray, but the edges do not look sharp from here. Starting at the bottom of the case, we see rubber pads where the case has bumpers for the PSU. The seven slots use screws instead of thumbscrews. Finally, somebody gets it: you can’t get your fingers close to the back side of the case; you can’t really screw in a thumbscrew with your fingers and thumb. So you use a screwdriver. But a thumbscrew is often so heavy that it falls off the magnetic tip of the screwdriver. So a standard screw is much better. 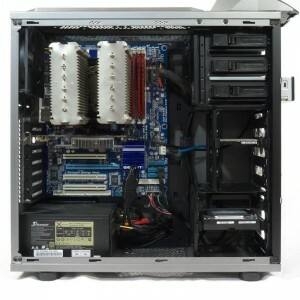 Note that the exhaust fan has only a 3-pin plug, so it will only go into a motherboard fan header or an adapter. 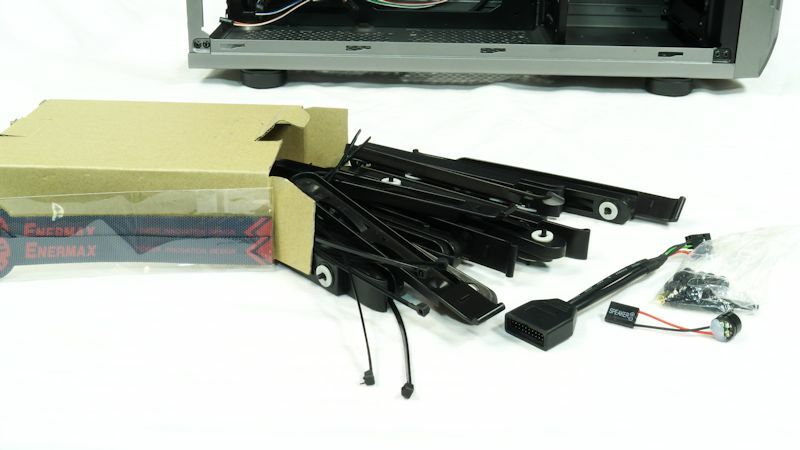 No Molex connector or adapter is supplied. 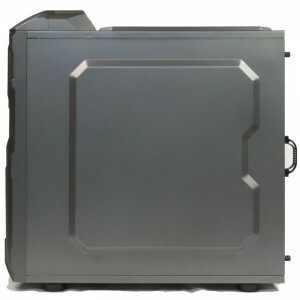 Crossing to the other side of the chamber, the three 5.25″ slots have easy slide-in latches. Just slide in your device and it is set. It is one of the smoothest-operating slide-in latches I have used. Below the 5.25″ bay is what looks like a 2.5″ HDD bay. But the side wall is movable, so it can accommodate four 3.5″ devices. 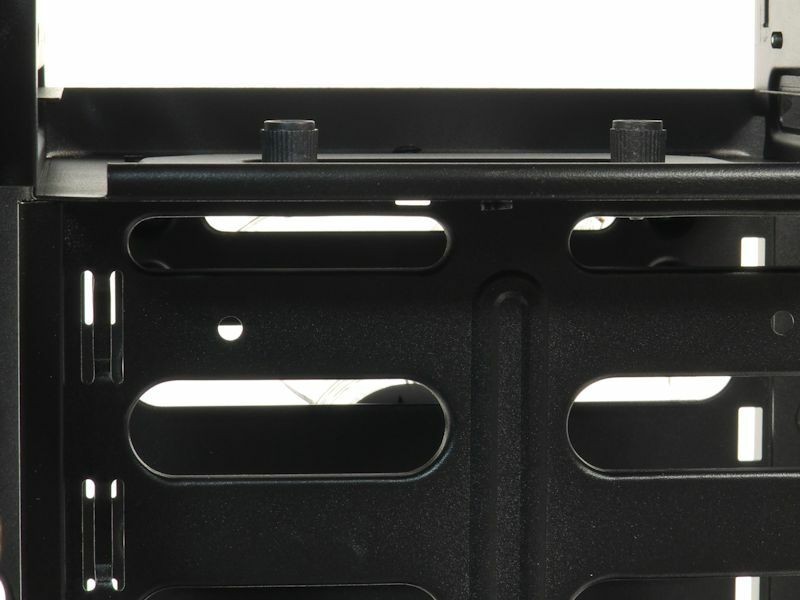 At bottom there is a three-slot 3.5″ HD bay. Unfortunately, all the sidewalls look fairly restrictive for airflow. In the closeup of the motherboard tray, that little opening in the upper left corner that looks like something took a nibble? That’s for the EPS 12v plug. The CPU window is nice and large, and eight of the nine standoffs are present (why only eight?). None of the standoffs are studs, so there is nothing to hang your board on while you screw it in. From here you can see how the right panel is expanded for cable management. You can also see that the motherboard tray has a number of cable tie points on its backside. 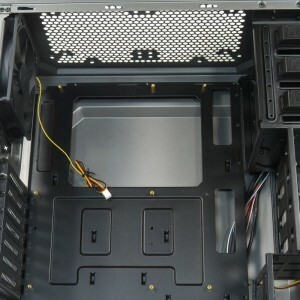 The tray has screw holes for ATX and mATX, which means you could also put a mini-ITX board in the case. But no other types of motherboards. 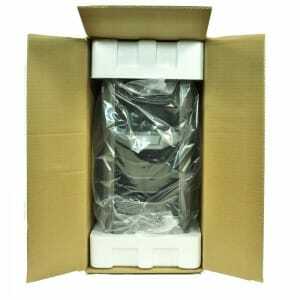 You saw that box full of accessories in the 2.5″ bay? Well, let’s open it up. Inside there are Enermax Velcro tape ties, 22 side rails, some zip ties, a dual USB3-to-USB2 converter, a little computer speaker and a bag of screws. The bag of screws by the way, contains the ninth standoff, in case you were wondering where it was. But why 22 side rails? 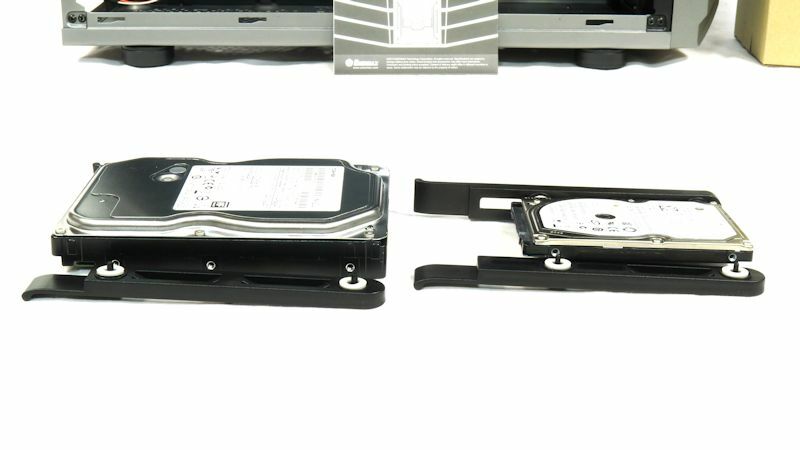 It turns out that the screw hole positions on the sides of 2.5″ and 3.5″ hard drives are different. 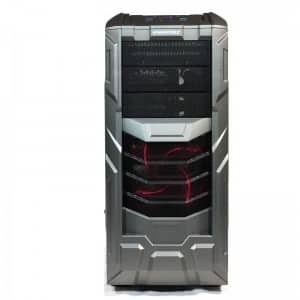 So, because the top side wall can move, Enermax supplied seven pairs of 3.5″ side rails and four pairs of 2.5″ side rails. They go on easily and don’t fall off too readily. Those white washers are cushions, really. But a loud hard drive will make itself heard in this case. One nice thing about detachable side rails is that they leave the top and bottom surfaces exposed to airflow to keep them cool. Here is the wire bundle from the front of the case. The bundle includes the usual suspects, as well as an AC ‘97 plug springing from the HD audio plug. Also included in the bundle is the wire from the front fan, which has only a 3-pin plug. 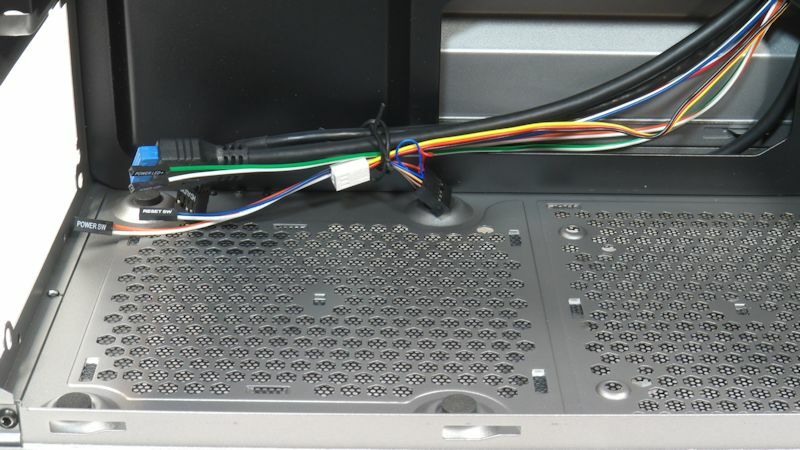 Again, no Molex connector. What if your motherboard does not have a spare fan header? Opening up the front of the COENUS we can see that the faceplate comes entirely free of the case – but only after a mighty pull. To put it back though, you must wedge it under the overhang, angle it back in, then give it several sharp taps to seat it. As noted above, the slot covers double as filters. There is room for a 140 mm fan, but no screw holes for one. You will have to use double-sticky Velcro if you want to mount a 140 mm fan. Instead, you have threaded holes for one or two 120 mm fans. 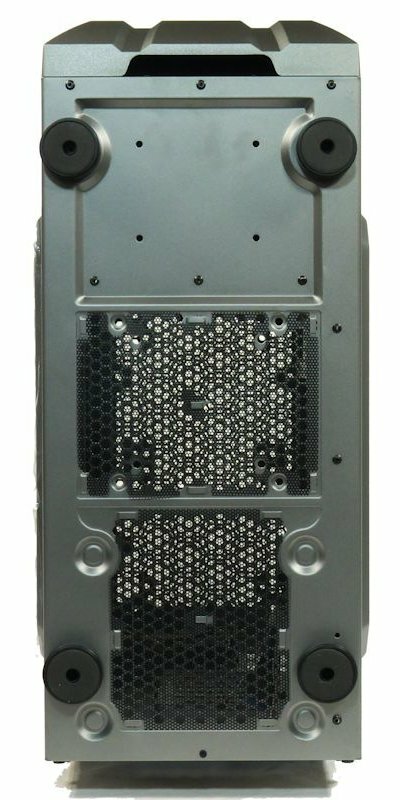 Behind the fan we can see a fairly restrictive HDD cage wall of steel that any front fans will have to push through. This is not so bad if you have the cages filled with hard drives. But when it is mostly empty the side wall still restrict airflow. Maybe Enermax knew what they were doing when they left such a small filtered area in front of the front fan or fans. 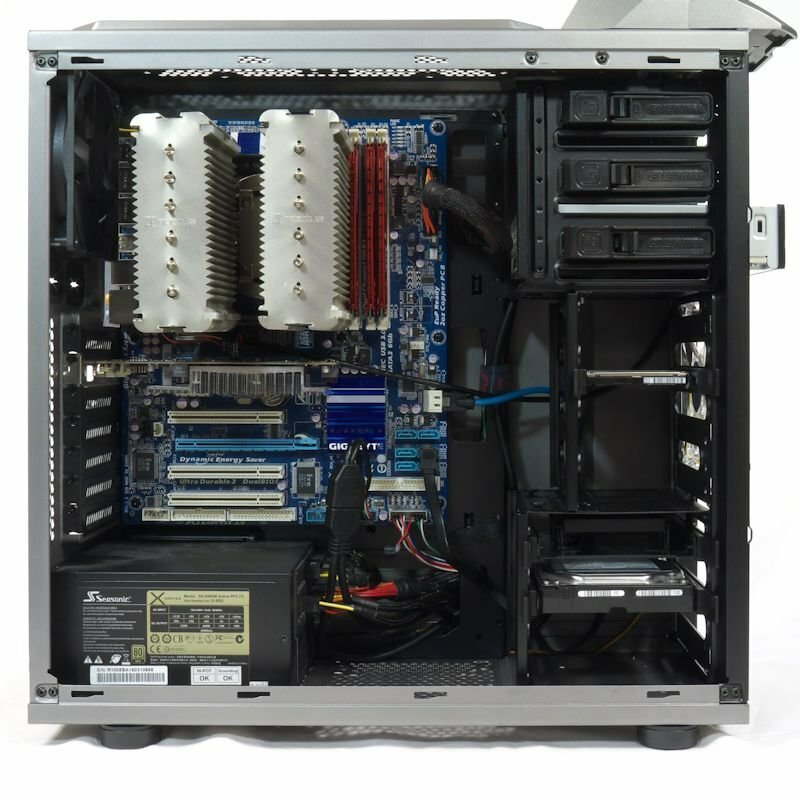 If you are willing to forgo a case-mounted ODD (there are a number of external drives available), you can put a 140 mm fan in the 5.25″ bay. There is room for it, as you can see. 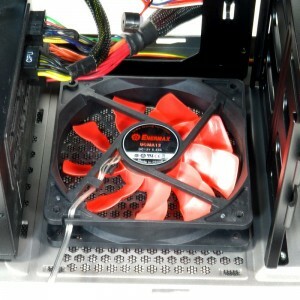 The fan is an Enermax 14 cm T.B. Silence, by the way. Here you can see the front fan. It is an interesting cost-saving measure that Enermax chose not to install their own fan, either here or in the back. Those screws, though… so few threads. Next you can see two fans in place. 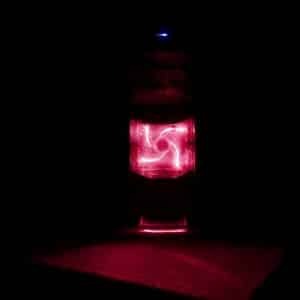 Why did I use some old screws I had lying around? 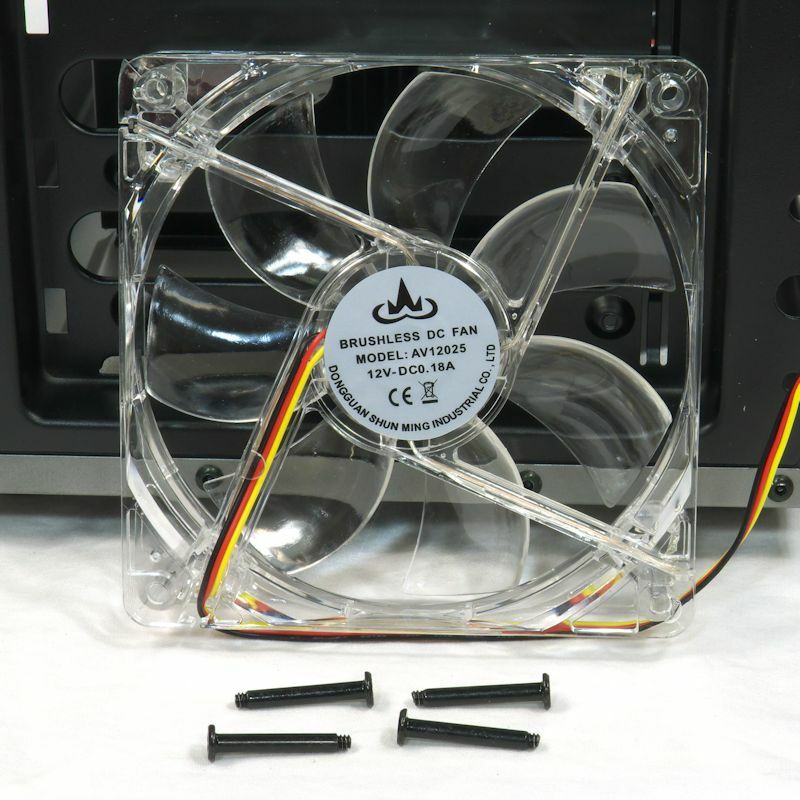 Why not use screws that were supplied for fans? After all, there are four of these in the accessory bag. 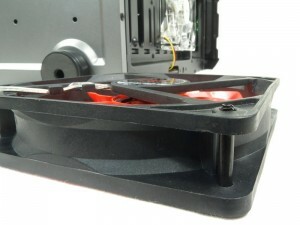 The Enermax fan was perhaps a millimeter too thick for the case screws to fit. There aren’t enough threads to catch. There are plenty of fans that are this thick. 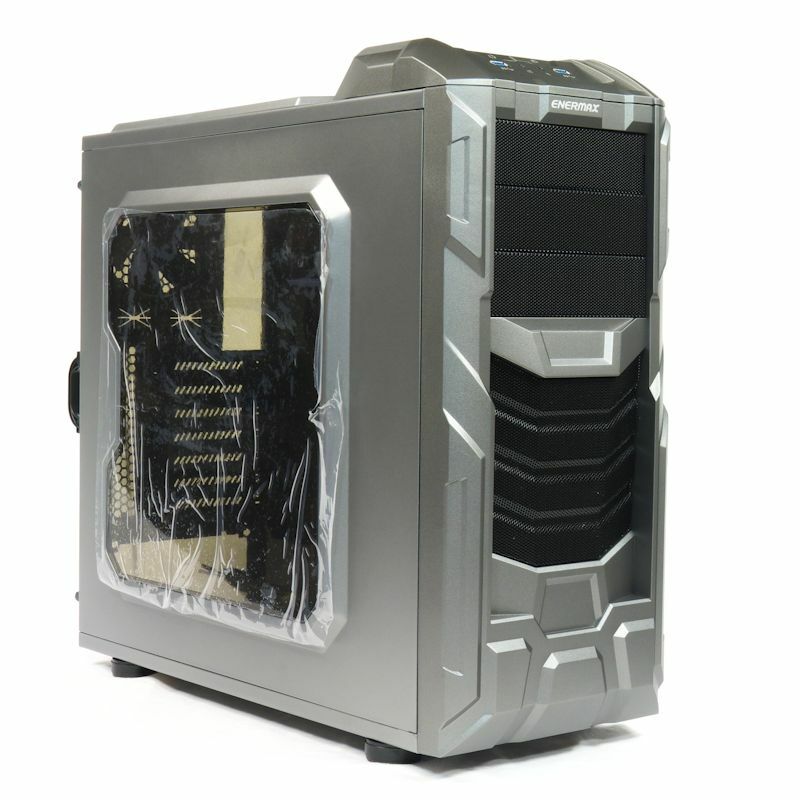 A picture from the right side of the case shows just how large the CPU window is. 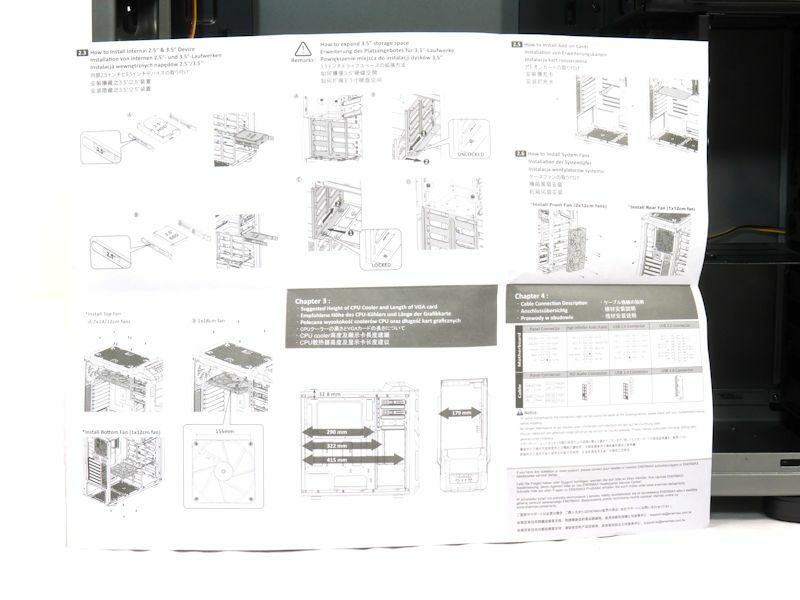 Basically, no motherboard will put the back plate where this motherboard tray covers part of it. With so many cases skimping on the size of that opening, it is gratifying to see a truly large CPU opening. Several tie-down points are present. Note that the front wires are wrapped with the Enermax Velcro tape tie. 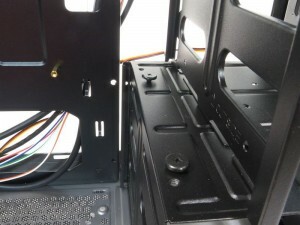 Between the motherboard tray and the end of the case there is 17 – 18 mm. Experience has shown this is barely enough for ATX24 cables. 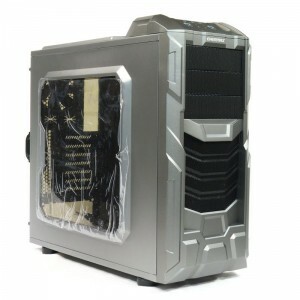 How nice that this case has expanded side panels. Any system builder would appreciate 30 mm clearance behind the motherboard. The edges of the cable pass-through openings have been rolled. Actually, when I put my finger on them the edges feel hemmed, then rolled. In any case, no harm will come to cables or fingers. Back around to the main chamber again. 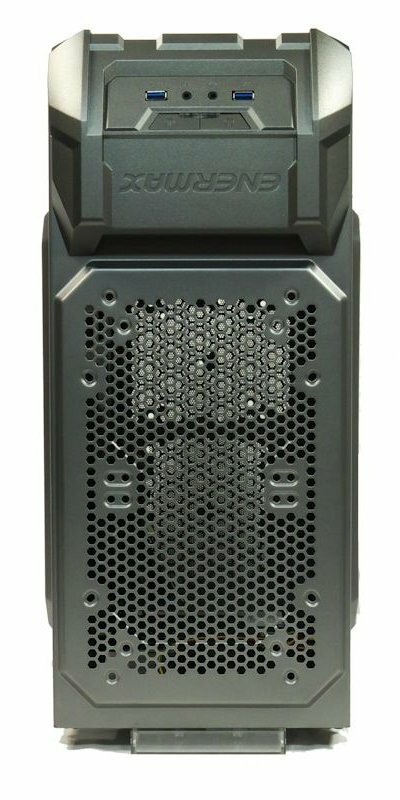 Let us consider the movable sidewall of the upper HDD cage. Here you see where the bottom slots in, doing a little jig to lock in securely. Up at the top, the partition is held by two more of the same excellent thumbscrews Enermax used at the rear of the case. 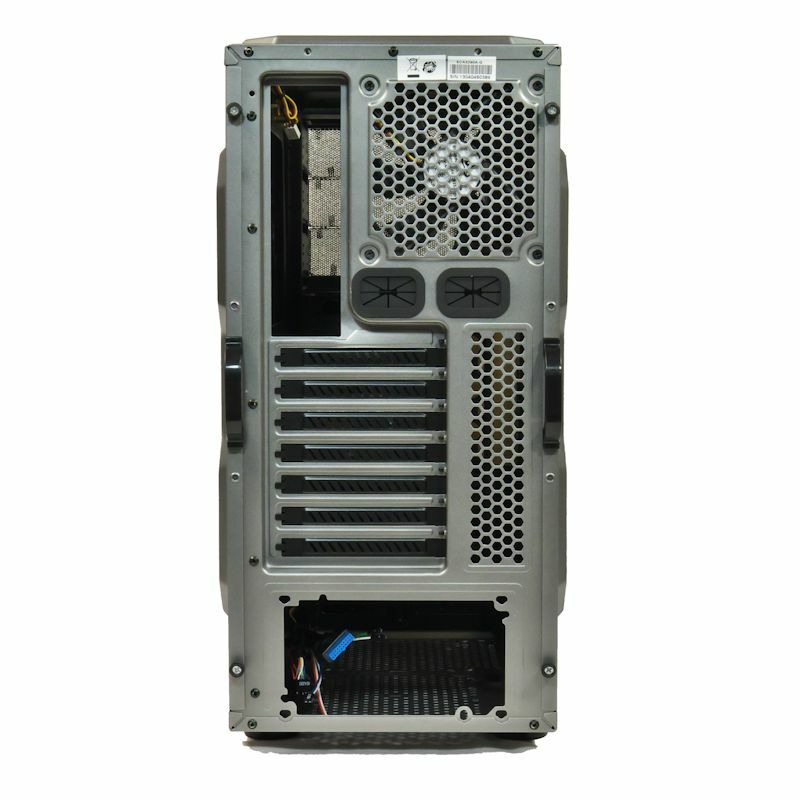 You can also see why there is room for a 140 mm fan in the 5.25″ bay. 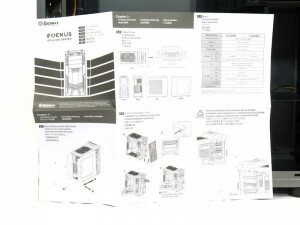 The second picture shows a system built into the Enermax COENUS. You can see how the USB3 adapter was put to good use on this old board. There is an ODD in the lowest 5.25″ slot, a 2.5″ hard drive in the 2.5″ HDD cage, a SSD on a 3.5″ sled in the lower HDD cage, and a 3.5″ hard drive in the middle position of the lower cage. To test this case I would need the best airflow possible, and to have the fans set up the way the factory set them. So both cages were set to 3.5″. The 3.5″hard drive was moved up into the airflow. The system is ready for testing. At 38 minutes 18 seconds OCCT shut down its run because the CPU had reached its limit of 87 °C, or 65 °C over ambient. The GPU averaged 49 °C in its last ten minutes, but even so it was edging higher, 50 °C and rising. 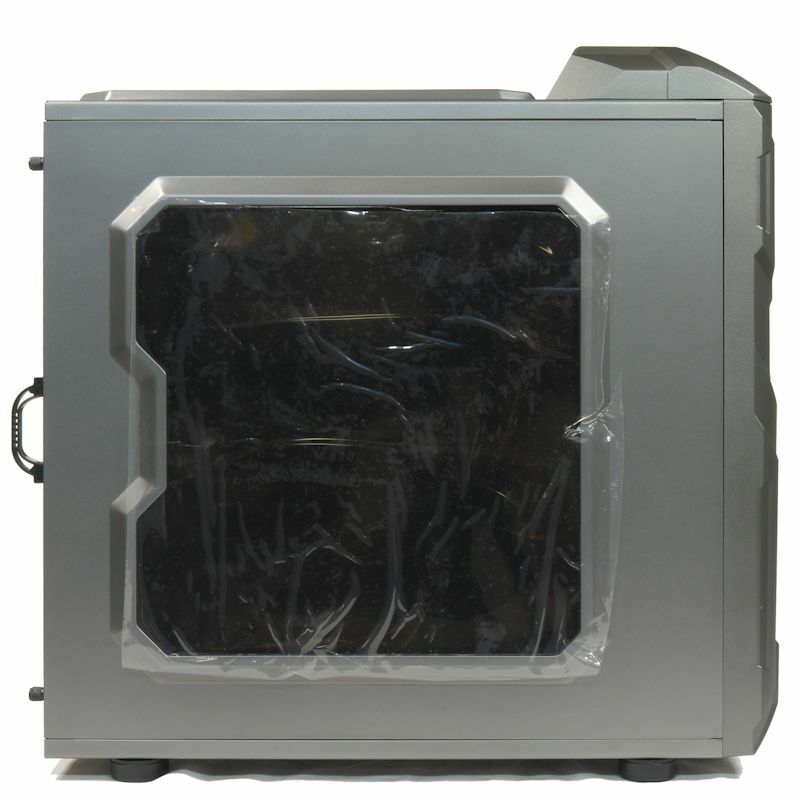 In essence, there is no airflow in the main chamber. 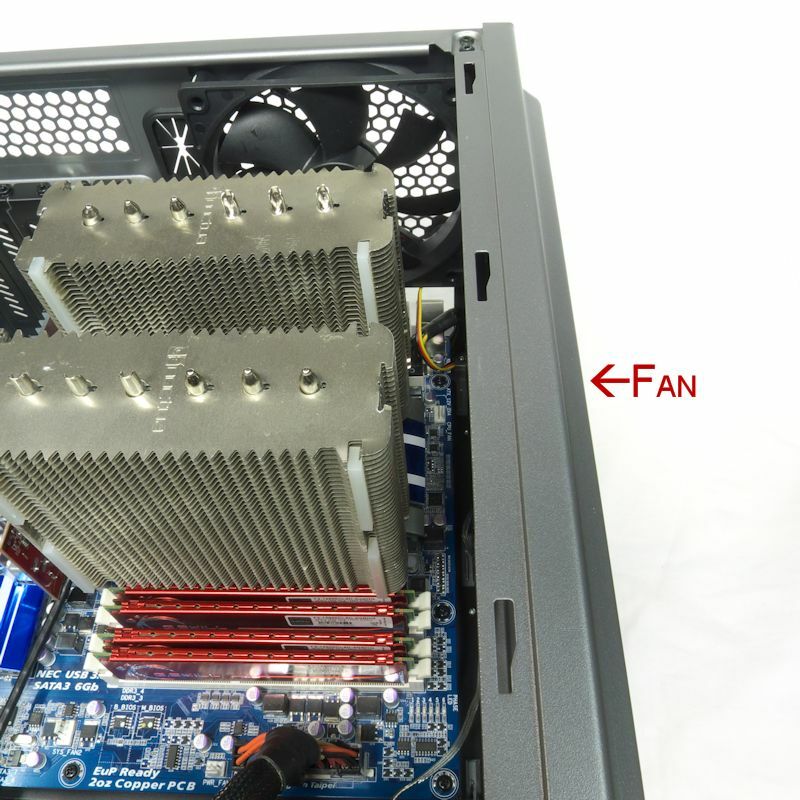 The reason is made obvious in the various pictures of this case: the wide open top of the case begs for fans. Without them, the COENUS is just a steel box, open at the top. For someone with fans this smacks of many possibilities. This case is an airhead’s playground. 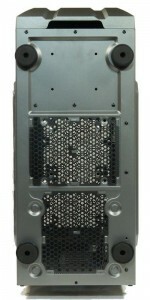 At the front, conditions in the upper HDD cage were another matter. The spinning disk hard drive sat at 30 °C for an entire hour, never edging higher. The SSD stayed at 26 °C. These temps represented 8 °C over ambient for the HDD, 4 °C for the SSD. Those are cool drives. The fact that the temps did not increase indicates the airflow was heading into an open chamber and faced no resistance. Again, the wide-open top shows its effect, making what happened in the front independent of conditions elsewhere in the case. Noise levels were measured 10 cm from the corner of the case and 1 meter in front. The 10 cm reading was 44.5 dBA, or 24.5 dB, corrected to 1 meter. The actual measured sound pressure level 1 meter in front of the case was 34.5 dBA, or about 4 dBA higher than the ambient SPL. Note that 30 dB sounds silent if we are sitting in a room. I had to unplug the hard drive to get these sound levels. It added appreciable noise that you could hear through the case walls. The fan in front did not click. The fan in the back had a very quiet rapid clicking, but you had to have you ear right near to hear it. So this is an audible, but quiet case with most of the noise coming from air sucked in through the front filter. However, if you want to keep it that quiet you will need quiet components; the case walls will not muffle the sounds your hardware makes. Without messing around with roof fans, let’s try some possibilities. First, we will try putting some pull fans on the downstream side of the hard drive cages. We will start with the top in its 2.5″ position. 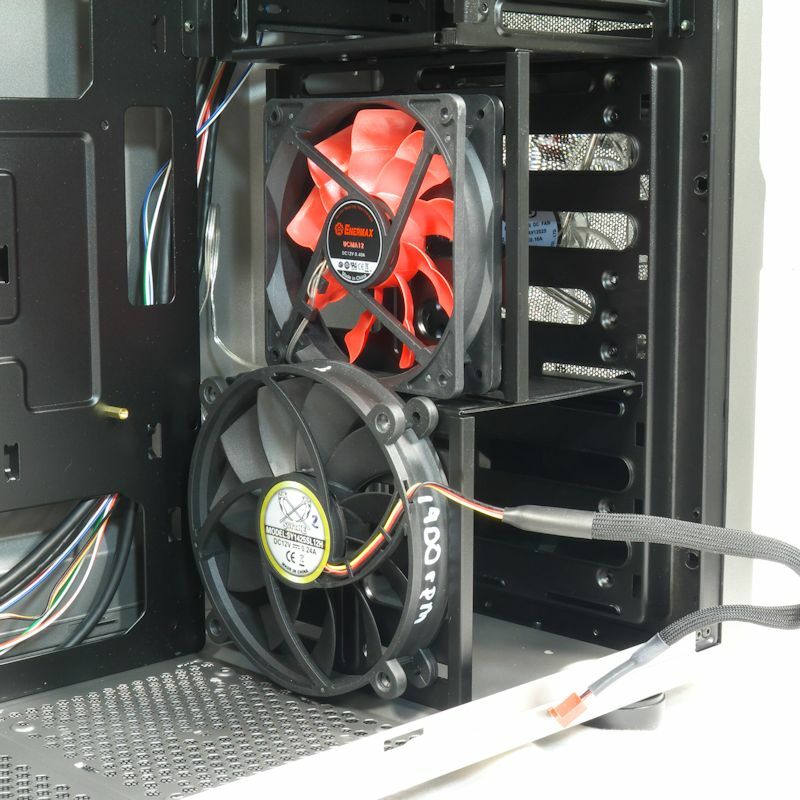 A 120 mm fan has room to sit between the end ridges of the top partition, but there is no room for a 140 mm fan. 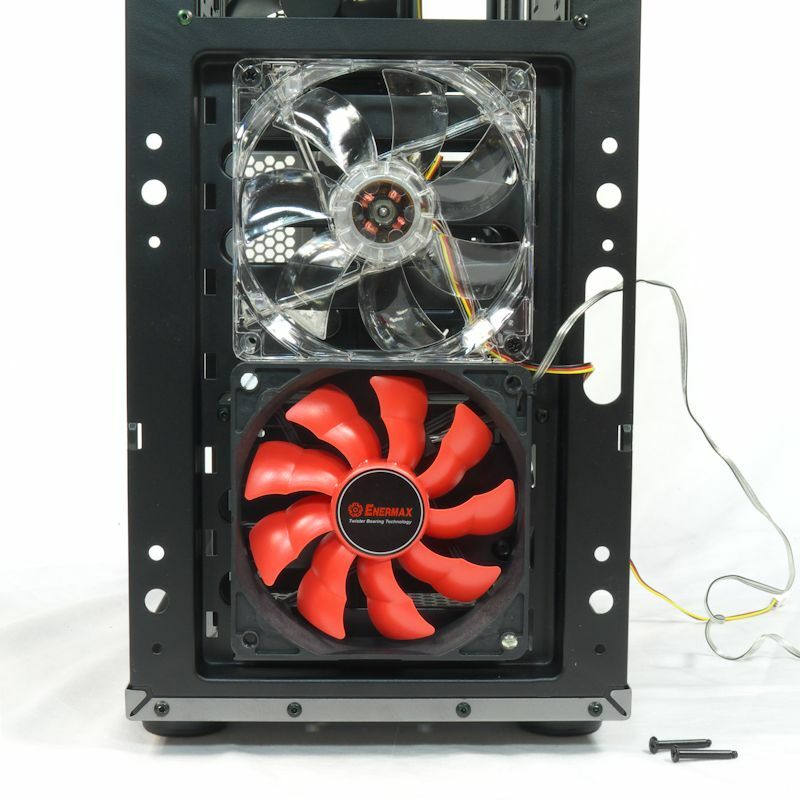 Nor is there much room for a 140 mm fan on the side of the bottom cage. One will fit, however, if you use Velcro. 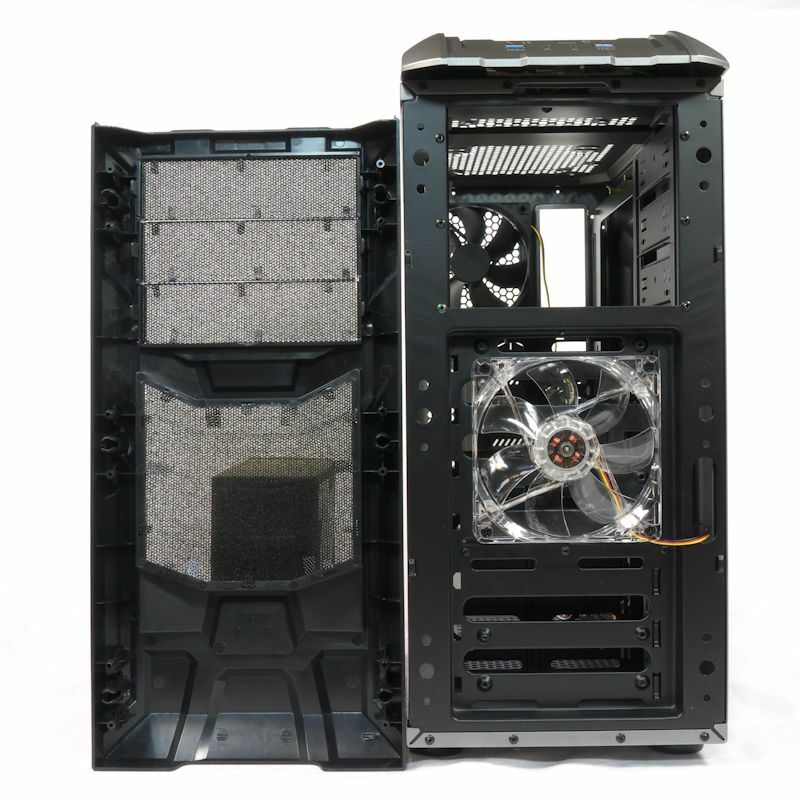 When the partition is moved to its 3.5″ position, there is no room for a 140 mm fan anywhere. What is odd is that there are two screw holes threaded for 6-32 screws on one side of the upper side wall. Why is there not a matching pair of holes on the other side? 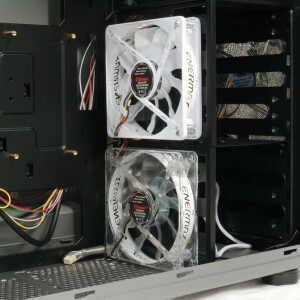 Basically, if you want pull fans to improve the airflow through your HD cages you will have to Velcro the fans. The bottom will fit a 120 mm fan. You might fit a 140 mm fan in there, but it would be a kludge. 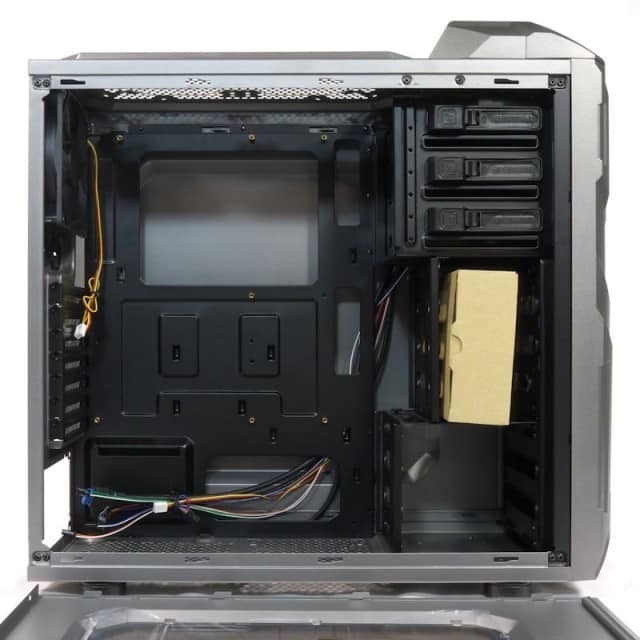 The top of the case is expanded upward, essentially hiding the fan. 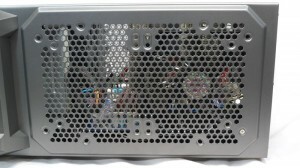 From the top, it looks as if the case was designed for a top radiator, either 240 mm or 280 mm. Don’t be fooled. The COENUS is too short for that. From beneath, a 140 mm fan does fit. But a fan on a rad would interfere with motherboard components. I tried stacking two 140 mm fans and then two 120 mm fans to simulate a radiator and fan. Two fans stacked vertically just would not fit. One last picture of the Coenus to show off its front LEDs. 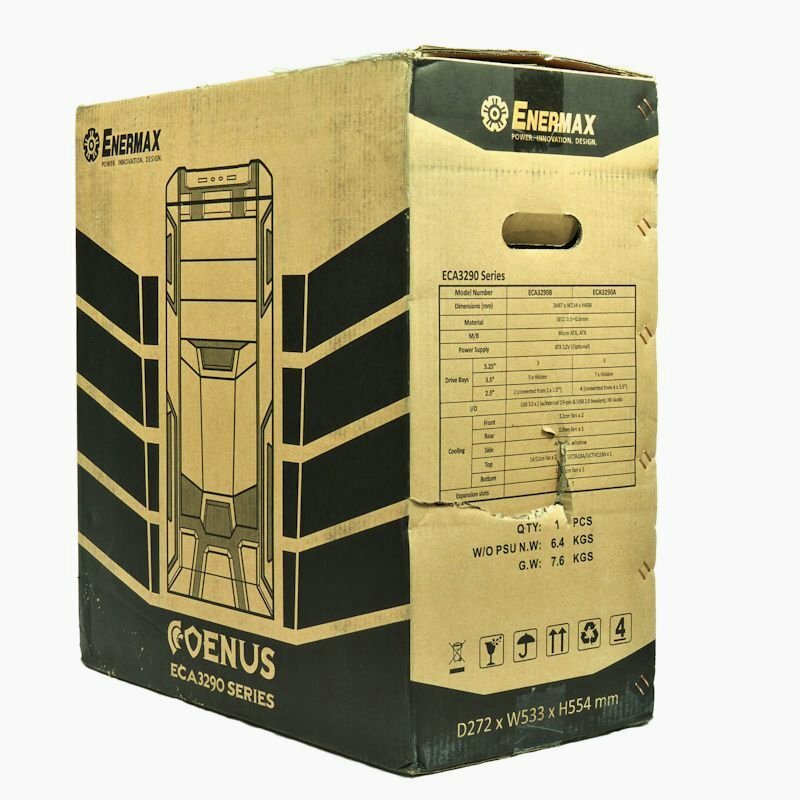 The Enermax COENUS is an airhead’s playground. Sure, concessions were made to waterheads, but this really is a fan-lover’s case. The COENUS was average to work in. The opening for the EPS12V plug was big enough to get the plug through without terrible difficulty, but there is not quite enough room to plug it into the motherboard unless you remove your heatsink first; or if you have a modular PSU you can pull the EPS12V cable far enough into the case to plug it into the motherboard, then fasten the motherboard to the tray. Otherwise, building a system in the Enermax COENUS was unremarkable. You don’t miss the absent grommets. You really come to appreciate the extra room you have for cables and your heatsink, however. Both side panels were easy to get off and fairly easy to get back on. I really like the type of thumbscrew Enermax uses here. Even though I am not happy with how restrictive the HDD cages are, they are not the worst I have seen. Enermax is using side rails rather than trays means the hard drives were adequately cooled. 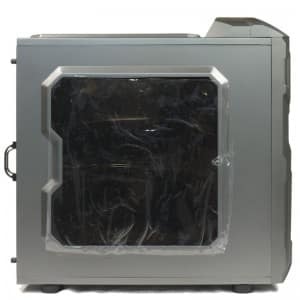 What the restrictive airflow in the HDD cages means for the rest of the case though, is that the front is not going to provide significant amounts of airflow to the rest of the case unless you install fairly noisy front fans. 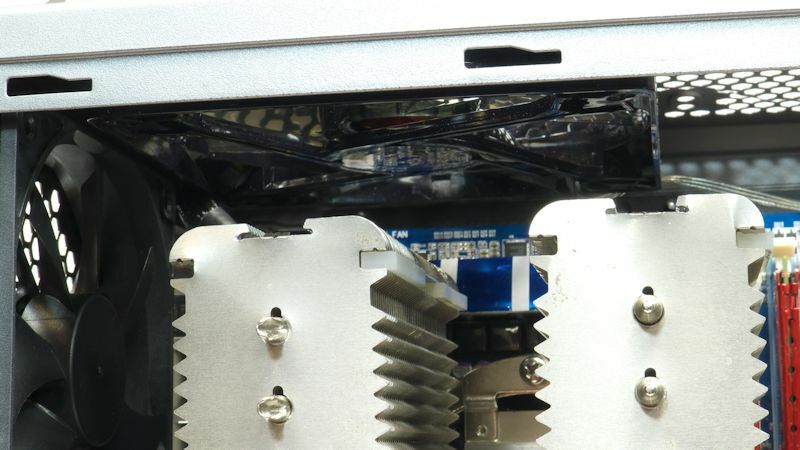 You might find yourself installing that bottom fan after all. 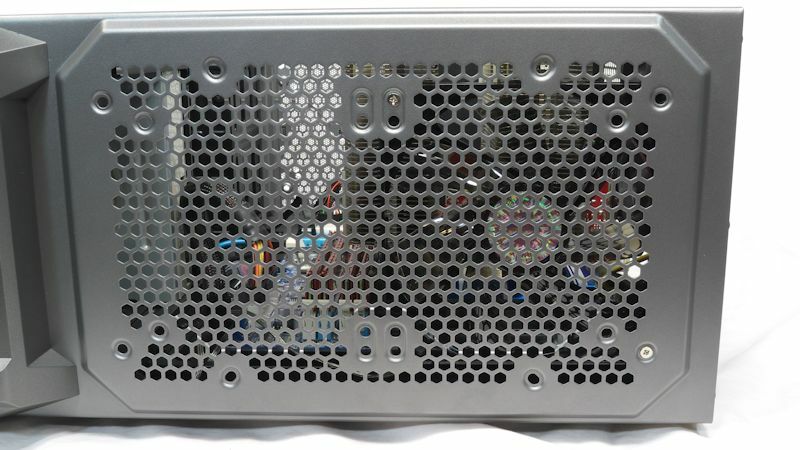 One nice thing about this case: there was no front grill to further restrict airflow. On the top, Enermax clearly had exhaust fans in mind. If you want to use top intakes you might remove the rear grill. Either way, you will want to put something in those top fan spaces. As I said, this case is an airhead’s playground. At $70, the COENUS has lots of competition. The width of this case for cables and a heatsink make it worth the price. As I peer inside the window and see that NH-D14. Yup, it’s pretty far back from the window. 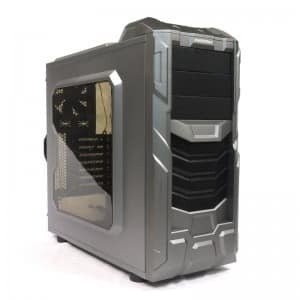 You will have enough room for a jumbo heatsink, and that seems to be the point of this case at that price point.